Public Forum, Lincoln-Douglas, and Policy Debate: 6 points for a win, 3 points for a loss. Congressional Debate: Between 1-6 points for each speech or hour of presiding, up to 24 points per day. Other Debate Events: 4 points for a win, 2 points for a loss. Each time a speech is performed, it is ranked from 1st through last place. Each performance earns points once, even if it was judged by more than one person. Extemporaneous Speaking, Original Oratory, Humorous or Dramatic Interpretation, and Duo Interpretation: 6 points for 1st place, 5 points for 2nd, 4 points for 3rd, 3 points for 4th, 2 points for any lower rank. Other Events: 5 points for 1st place, 4 points for 2nd, 3 points for 3rd, 2 points for 4th, 1 point for any lower rank. 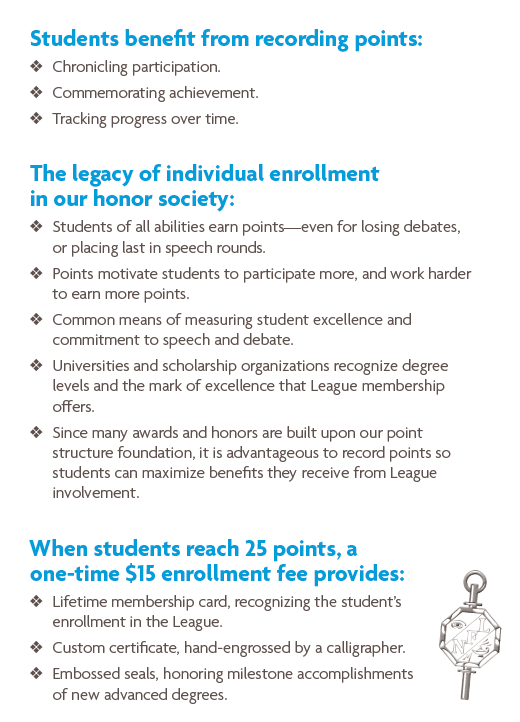 Students earn points for each speech of at least 4 minutes given to an audience of at least 25 adults beyond high school age. Why record points? What happens when you earn points?